A posh looking woman breastfeeding in the middle of a busy restaurant; a shirtless man looking very calm for being covered in hundreds of bees; a breast cancer survivor tattooing the scars on her chest. These visuals are no doubt provocative, even more so when you learn they are the visuals accompanying an advertising campaign by a gym. While certainly striking and sometimes controversial, not every one of these ads does a great job at showcasing the gym and its services. They do however incite curiosity and have no doubt driven clicks to learn more about the people portrayed in the images. In linking the use of Equinox gyms to committing to a better, bolder lifestyle, Equinox targets the potential customers who are searching for that higher-end experience. By using provocative imagery, Equinox ensures their ads are seen and even given a double-take by those scrolling online. Some of the visual choices in the campaign do align well with a gym – a male gymnast showing off his awards, a physically fit amputee, or the countless shirtless models across all of the ads. 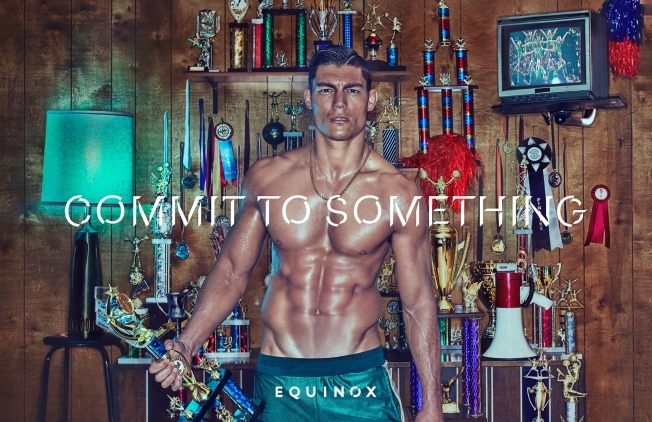 These images, when paired with the “Commit to Something” tagline, appear powerful and inspiring, bringing the typical gym advertisement to another level. The bold photography used across the campaign further differentiates Equinox from other similar gyms and fitness brands. Most of the images used are so far off from a gym scene that they could become confusing at first glance (and oftentimes the first glance is all a brand gets before the viewer moves on). A woman standing in a kitchen with her ten cats does little to promote fitness classes, or even a traditionally desirable lifestyle… though it does show that she has committed to her wish of keeping numerous pets. Some of the ads even promote illegal imagery, such as the photo of a woman watering her marijuana plants. This also does little to portray a healthy or attainable lifestyle. When taken literally, the “Commit to Something” ads could offend a number of viewers. Commit to joining a cult? In 2017, it is difficult to stand out from the crowd, and easy to offend audiences by trying to do so. Brands that commit to stepping outside of the box to promote an image or idea deeper than what they represent on the surface should at least be commended for trying. Equinox knows who its target audience is, and knows that it is made up of people willing to be different, to change their lives drastically, or to live in luxury. The fact that Equinox has successfully grown to over 90 locations and continues to expand in both the fitness and hospitality industries, means it must be doing something right.